From now on, new Genki members will be entitled to a welcome offer – a Classic Genki Teacup & a pack of Green Tea Powder (50g). To redeem, simply present the e-coupon at Hong Kong Genki Sushi outlets. The e-coupon will be sent to the Genki membership account via Genki Sushi Mobile APP within 24 hours from the date of the membership confirmation email. Members must activate the virtual Genki Card by logging into Genki Sushi Mobile APP using Genki Card number/registered email address and password in order to retrieve the e-coupon. The e-coupon will not be re-sent if expired. This welcome gift e-coupon will be valid for 90 days from the date of issuance. Please refer to terms and conditions of e-coupon for usage details. During the validity period of the Genki Card, 1 Genki Point(“point”) will be credited for every $10 spent (based on the total net amount of the transaction). The spending in cents and transaction under $10 will not be counted in calculating point earned for any transaction. For example, if the net transaction amount is $125.50, 12 points will be earned. Every 10 points can be used as $10 in the subsequent transaction at Hong Kong Genki Sushi outlets. Points can be used in blocks of 10 points. Point used will be deducted from the Genki Card account instantly at the transaction. Offer is valid for dine-in, take-away purchase and Genki Sushi Delivery Service (except Deliveroo delivery service). Genki members may enjoy a one-time 20% off for dine-in at any Genki Sushi outlets in Hong Kong during his/her birthday month (e.g. If the member’s birthday is on 15 Oct, birthday month covers the period from 1-31 October.) by presenting his/her Genki Card. Please present valid Genki Card at the time of payment. This offer is only valid at Genki Sushi outlets in Hong Kong. For dine-in only. Additional 10% service charge levied and calculated from original dine-in total before the coupon discount is applied. Points can be used together with this birthday offer but will not be awarded for the whole transaction; this offer cannot be used in conjunction with other Genki Sushi coupons, gift vouchers, or other discount offers. If a member become a Genki member in his/her birthday month, the member may enjoy the birthday offer in his/her birthday month in the following year. For example, the member has registered as Genki member in June which is also his/her birthday month, he/she may enjoy the birthday offer in June in the following year. Get a queue ticket before arriving our outlets via Genki Sushi Mobile APP to shorten the waiting time. Receive first-hand news, menus and special offers from Genki Sushi. The above offers are subject to Terms and Conditions of Genki Membership Program and Member Privileges. For details, please refer to Genki Sushi website or Genki Sushi Mobile APP or call 2101-1161 (Monday to Sunday: 10am - 9pm). Genki Sushi Hong Kong Limited reserves the right to amend the Terms and Conditions of Genki Membership Program without prior notice. In case of any disputes, the decision of Genki Sushi Hong Kong Limited shall be final. Genki Sushi Hong Kong Limited (“Genki Sushi”) is owned and operated by Maxim’s Caterers Limited. The Genki Membership Program is operated by Genki Sushi. Genki Card is issued by Genki Sushi. An applicant or a Genki member (“member”) who participates in the Genki Membership Program hereby confirms that he/she agrees to be bound by the terms and conditions set out herein below and as may be amended by Genki Sushi from time to time. The applicant is required to download Genki Sushi Mobile APP and register for a Genki Point Card with email address or Facebook account at “Recruitment” section. Each valid email address or Facebook account can register once only. Genki Point Card with no spending records will be invalid after 180 days. The applicant must be aged 18 or over. Each person may apply for one Genki Card only. To be eligible for membership application, the applicant is required to accumulate spending of $950 on one Genki Point Card within the time limit of 62 days from the date of first recorded transaction. The said time limit of 62 days starts from the day immediately after the date of the first recorded transaction. For example, if the date of the first recorded transaction is October 1, 2018, the last day of the time limit will be December 2, 2018. Only spending at Genki Sushi in Hong Kong will be counted towards the cumulative spending amount, spending on Deliveroo Delivery will not be counted. The cumulative spending amount is calculated based on the original price with 10% service charge while all other promotional offers and discounts are excluded from the calculation. Genki Point Card must be presented upon payment to record the transaction, and the entire transaction can be recorded on one Genki Point Card only. No transaction will be recorded in any Genki Point Card after payment under any circumstances. Spending recorded in different Genki Point Cards cannot be combined. Record of cumulative spending in a Genki Point Card will be updated within 24 hours after the transaction. The applicant can check his/her cumulative spending record via Genki Sushi Mobile APP. Genki Sushi’s record is final and conclusive. Any spending at Genki Sushi before the applicant has become a member is not eligible for earning Genki Point. 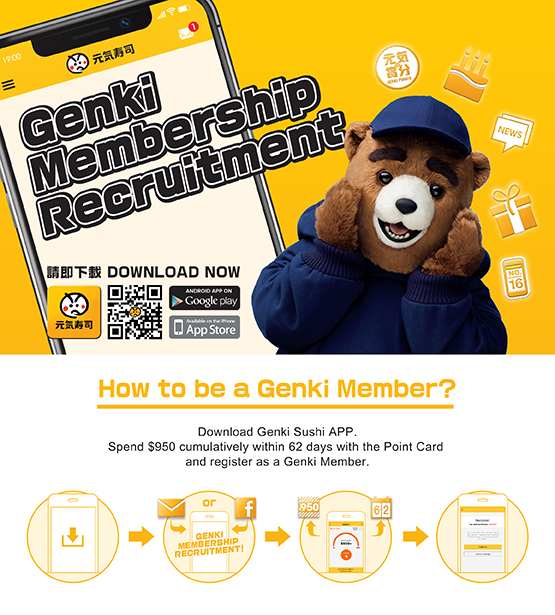 After the applicant has accumulated spending of $950 on one Genki Point Card within the 62-day period specified above, he/she is required to provide personal details and filling in an application form via Genki Sushi Mobile APP within 180-day period to apply for Genki membership. Any Genki Point Card that fails to be registered within the 180-day period will be forfeited automatically and under no circumstances will Genki Sushi allow or accept Genki membership application using forfeited Genki Point Card. If the application is successful, the applicant will receive a membership confirmation email and be given a Genki Card number within 24 hours after application. In order to apply for Genki membership, the applicant must complete all mandatory fields in the application form in full and provide true and accurate information. Genki Sushi will not process any incomplete or inaccurate application and reserves the right to decline any application for Genki Card at its sole discretion and without giving any reason therefor. Any request to amend an applicant’s personal information after submitting the application form can be made in writing to Genki Sushi’s Data Privacy Officer. Genki Sushi Mobile APP, Genki Point Card and virtual Genki Card are only applicable to mobile devices using iOS 8.0 or above and Android 4.4 or above. Genki membership is valid for two years only. Only virtual Genki Card in mobile device will be issued. Member can login to Member’s Area via Genki Sushi website or Genki Sushi Mobile APP to check the expiry date of the Genki Card. In order to safeguard the rights and privileges of member, Genki Sushi will send the membership expiry date before expiration of membership. Upon membership’s expiration, member must apply for renewal or apply for a new card in order to enjoy the rights and privileges of a member. Member is solely responsible for the safe keeping of his/her Genki Card number and password and shall not disclose or divulge such information to any third party. Genki Sushi is not liable for any loss or damages suffered by member arising from the loss, theft or use of his/her Genki Card number or password. If there is any suspicious or irregular activity or transaction relating to member’s Genki Card account, please immediately contact Genki Sushi Customer Service Hotline at 2101-1161 (Monday to Sunday: 10am – 9pm). Genki Card is not transferable or assignable and is for member’s personal use and benefit only. Verification of member’s identity may be required. Genki Card cannot be used in conjunction with other promotional offers, discounts and gift vouchers. Except where otherwise provided, member is entitled to earn Genki Point (“points”) upon purchasing regular-priced items at Genki Sushi outlets in Hong Kong, points are calculated based on the total net amount of the transaction. The amount of 10% service charge will not be counted in calculating points earned for any transaction. Valid for dine-in, takeaway purchase and online takeaway ordering, except Deliveroo Delivery. To enjoy the privileges, member must present the Genki Card at the time of payment. If Genki Card cannot be presented at the time of payment, in no event will or can points be earned or used for that transaction. Points earned will be credited to the Genki Card account within 5 business days after the transaction. Points used will be deducted from the Genki Card account instantly. The expiry date of points is the same as that of Genki membership. All unused points will be void upon expiration of Genki membership. Points cannot be transferred, gifted away, assigned or otherwise to other individual or Genki Card, and cannot be combined for use with points in other member’s account. Genki Sushi’s record (including but not limited to the record of points balance in each Genki Card account) is conclusive and final and binding on member. Member has no right to participate in the constitution, operation or management of the Genki Membership Program nor any right in or any claim to any assets of Genki Sushi. Member is responsible for keeping Genki Sushi updated on their correct mobile phone number and email address. Genki Sushi is not responsible for any loss or damage as a result of member’s failure to notify Genki Sushi of any change of mobile phone number and email address. Member may terminate his/her membership at any time by informing Genki Sushi in writing. All unused points will then be void and membership will be terminated. In the event of any breach of the Terms and Conditions of Genki Membership Program, or the use of the Genki Point Card or Genki Card is unauthorized or arises from act of misconduct, fraudulent or otherwise unlawful, Genki Sushi has the right to stop one’s participation in the Genki Membership Program and/or immediately terminate one’s Genki membership or his/her application with or without notice. Genki Sushi will not be liable for any loss or damage resulting therefrom and also has the right to take action for recovery of any loss suffered by Genki Sushi as a result of the breach of the Terms and Conditions of Genki Membership Program. Genki Sushi reserves the right to terminate Genki Membership Program and/or its operation at its sole discretion at any time with reasonable notice, where reasonably practicable, without giving any reason therefor. All rights and/or privileges of an applicant/member shall cease upon termination and Genki Sushi will not be liable for any loss or damages resulting therefrom. Not every member will be eligible to participate in all promotions and Genki Sushi may from time to time impose other limitations on member’s participation in any promotion. Member taking part in any promotion shall be deemed to have agreed to be bound by the applicable terms and conditions which may be imposed by Genki Sushi in relation to such promotion. In the event of any dispute arising from Genki Point Card, Genki Card or Genki Membership Program, Genki Sushi shall be the sole and final arbiter of such dispute and its decision shall be final and binding on an applicant and/or member. Genki Sushi reserves the right to amend the Terms and Conditions of Genki Membership Program or revoke any right and/ or privilege without prior notice. All changes or amendments are effective once announced on the Genki Sushi website or Genki Sushi Mobile APP. Applicant or member should regularly check whether the Terms and Conditions of Genki Membership Program has been modified or right and/or privilege has been revoked via Genki Sushi website or Genki Sushi Mobile APP as an applicant’s or member’s continued use of Genki Sushi website or Genki Sushi Mobile APP indicates the acceptance of any change to the Terms and Conditions of Genki Membership Program and/or revocation of right and/or privilege. In case of any dispute, decision of Genki Sushi shall be final. If there is any inconsistency or conflict between the English version and Chinese version of the Terms and Conditions of Genki Membership Program, the English version shall prevail. Please present valid Genki Card at the time of payment. This offer is only valid at Genki Sushi outlets in Hong Kong. Birthday offer is only applicable to Genki Card members who join in 2 months before the birthday month. This offer cannot be redeemed for cash, other products or discounts and any unused balance will be forfeited. For dine-in only. Additional 10% service charge levied and calculated from original dine-in total before the coupon discount is applied. Cannot be used in conjunction with other Genki Sushi coupons, gift vouchers, or other discount offers. Genki Sushi reserves the right to amend the terms and conditions without prior notice. In case of any disputes, the decision of Genki Sushi shall be final. What is the validity period of the new Genki Card? New Genki Card will be valid for two years. What are the benefits upon enrollment? Earn Genki Point with spending and turn them into reward cash at your next visit. The above offers are subject to Terms and Conditions of Genki Membership Program and member privileges. Genki Sushi Hong Kong Limited reserves the right to amend the Terms and Conditions of Genki Membership Program without prior notice. In case of any disputes, the decision of Genki Sushi Hong Kong Limited shall be final. For details, please refer to this webpage or call 2101-1161 (Monday to Sunday: 10am to 9pm). How do we find out about the latest members’ privileges? We will inform you of the latest members’ benefits through in-store posters, our website, social media, SMS or email. If you require more detailed information about our latest offers, please visit any Genki Sushi outlets in Hong Kong or login to the Genki Sushi website. Why can't I receive any promotional news from Genki Sushi? • Registered in the Office of the Communications Authority's “do-not-call registers” (https://www.dnc.gov.hk/public/dncquery). What is the Genki Point scheme? For every HK$10 you spend at Hong Kong Genki Sushi outlets with your valid Genki Card, you will earn 1 Genki Point. Accumulate 10 Genki Points to use as HK$10 on your next visit. Genki Point can be used in 10-point units. Genki Point cannot be exchanged for cash, other products, offers or discounts, and any unused balance will be forfeited. How do I earn Genki Point? For every HK$10 (net spending excluding 10% service charge) you spend at Hong Kong Genki Sushi outlet with your valid Genki Card, you will earn 1 Genki Point. Decimal places and spending less than HK$10 will not be counted (e.g. receive 12 Genki Points for net spending excluding 10% service charge of HK$125.50). How do I use my Genki Point? Genki Point can be used in 10-point units, i.e. 10 Genki points, 20 Genki points and so forth. Members may use their Genki Point at any Genki Sushi outlets in Hong Kong, and must present a valid Genki Card with sufficient Genki Points at the time of payment. The Genki Point scheme cannot be used for delivery service. How do I check my Genki Point balance? When will my Genki Point balance be updated after each transaction? Genki Point redeemed will be deducted from your point balance instantly, Genki Point earned in each transaction will be credited to your account within 5 business days. Will I also earn Genki Points when I use my points for payment? Genki Point used for payment will not be awarded with points. Genki Point is calculated based on the total net amount of transaction. The amount of 10% service charge will not be counted for earning Genki Point. For example, if the total amount before 10% service charge is HK$250 and 20 Genki Points are used, the net amount eligible for earning Genki point is HK$230, thus, 23 Genki Points will be earned for the transaction. Under what circumstances am I unable to earn Genki Point? If you are restricted by the terms and conditions of specific promotional campaigns. The 10% service charge, discounts offers, coupons, purchase or use of gift vouchers and Genki Point used will not be awarded with Genki Point. May I combine Genki Point from two different accounts or transfer Genki Point to another member? To protect the interests of Genki members, members may not transfer Genki Point to others and may not combine Genki point from different Genki Cards. If I forget to present my Genki Card at the time of payment, can I still earn Genki Point? If you are unable to present a valid Genki Card at the time of payment, Genki Point will not be granted for the transaction and will not be credited at a later time. What is the validity period of my Genki Point? The validity period of Genki point is the same as that of the associated Genki Card. Unused Genki point will be voided when the Genki Card expires. Can I earn or use Genki Point at Genki Sushi stores outside of Hong Kong? The Genki Point scheme is only applicable at Hong Kong Genki Sushi outlets. How can I download the Genki Sushi Mobile App? You can download the Genki Sushi Mobile APP on Apple App Store or Google Play Store by searching "Genki" on the mobile devices. The Mobile APP supports mobile devices using iOS 8.0 or above and Android 4.4 or above. How to activate the Virtual Genki Card? Click on the "Member's Area" icon on Genki Sushi Mobile APP, and login with your Genki Card number/ registered email address and password. How can I get and redeem e-coupon on Genki Sushi Mobile App? Click on the "Coupon" icon to retrieve e-coupon on Genki Sushi Mobile APP. And show your e-coupon barcode to our staff when you settle the payment. Genki members have to login to the Virtual Genki Card in order to retrieve members’ exclusive coupons (if applicable). Note: Genki Sushi will offer different kinds of promotion from time to time. Please refer to the related promotion materials for details. Can I share my Genki Card information to my friend? For your account's security, we do not recommend sharing your account details with others. System will only allow one account login per session. If we change another mobile phone, how can I transfer my Genki Card information to the new mobile phone? You can simply download the Genki Sushi Mobile APP to your new mobile phone, and start using your Virtual Genki Card or e-coupon by logging into your Genki Card account. How can I enjoy member's privileges if I cannot login to the virtual Genki Card? You may login to the Member's Area at Genki Sushi website, and present the barcode to cashier, you will then be able to earn and use Genki Points for the transaction. However, you are still unable to use e-coupons. How do I login to the Member's Area? To login to the Member's Area of Genki Sushi website or Genki Sushi Mobile APP, please enter your 8-digit membership number/ registered email address and password. You may change your password after logging into Genki Sushi Member's Area at Genki Sushi website. Click “Change Password” and select a new password containing 8-12 letters and numbers. What should I do about a lost, stolen or damaged Genki Card? If your Genki Card is lost, stolen or damaged, please call the Genki Sushi customer service hotline at 2101-1161# to speak with a customer service representative. Your card will be immediately invalidated after confirmed you report it lost or stolen, and the Genki Point will also be immediately inactivated. Genki Sushi is not responsible for losses (including Genki Point) incurred during the loss of a card. We will not re-issue new physical Genki Card if it is lost, stolen or damaged, but you can still login to virtual Genki Card via Genki Sushi Mobile APP to enjoy your member's privileges. If my Genki Card is lost or stolen, will the Genki Point in my account be voided? We will transfer all available Genki Point in the card that is reported lost (balance as reflected in the computer database of Genki Sushi at the time the card is reported lost) to your new Genki Card. If you did not provide an email address at the time of registration or if you have other question about member login, please call the Genki Sushi customer service hotline at 2101-1161 (office hours: Monday to Sunday: 10am to 9pm) or email to member@genki.com.hk, our customer service representative will contact you within 3 working days upon receiving your request.